Beginning in March 2014, participants in the Flood Community of Practice have regularly come together to discuss, share and explore various aspect of flood risk management. In the display on the sequence of topics that we have considered, a varied array of issues have been addressed – and certainly there are no shortage of other suitable topics as well. If you want more details, all the presentations of these past events are just a few clicks away on our Past Events pages. Along the way we have had the occasional half and/or full day workshops. This has allowed us to better explore a theme and to allow participants a greater opportunity to share and play an active part in the discussion. Being actively engaged in an activity is not only rewarding, but it also helps build the collective capacity of our Flood Community of Practice. Soon in early August we will be hosting a significant mutli-day workshop called SEQ WaterFutures. This is a “planning charrette” based approach that will build on the experiences and insights of the many issues we have discussed over the last 2 years. It will be an “ideas and testing festival” that looks at how South East Queensland – and in particular the communities of the Brisbane River catchment – can be best prepared for future impacts from extreme water events – such as floods and droughts. Already significant work is underway through a consortium of State and Local Government on the Brisbane River Flood Studies – and this planning charrette aims to build on this work and provide a suite of flood adaption and related options that can be considered in future SEQ initiatives. The workshop has engaged a multi-discipline mix of professionals along with local stakeholders. Highlights of the workshop will be posted on our twitter feed (@Flood_CoP) from Monday 8th August – so please follow and provide your feedback. Following the completion of the workshop we plan to have follow up seminars and the outcomes will be incorporated into other planned events latter this year – eg forum at the International Water Association World Congress. After 2 years of activity it is very satisfying for the Flood Community of Practice to be able to have a focused opportunity to utilise the learnings and insights. So in another 2 years what might be the focus? 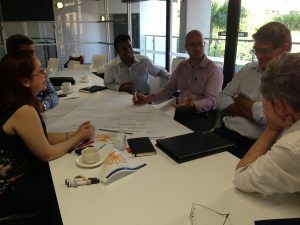 “Hacking” into the Queensland Climate Change Policy What is a Charrette?